MB Lucky Lady Feliz Navidad-ET was named Grand Champion of the International Jersey Show at World Dairy Expo. Christmas came early for Rivendale Farms of Pittsburgh LLC, Bulger, Pa., as their cow, MB Lucky Lady Feliz Navidad-ET, received top honors at the International Jersey Show at World Dairy Expo. The 4-year-old cow was also the Senior Grand Champion of the show. Conroy and his associate, Justin Burdette of Mercersburg, Pa., evaluated the 388 entries that walked across the colored shavings. 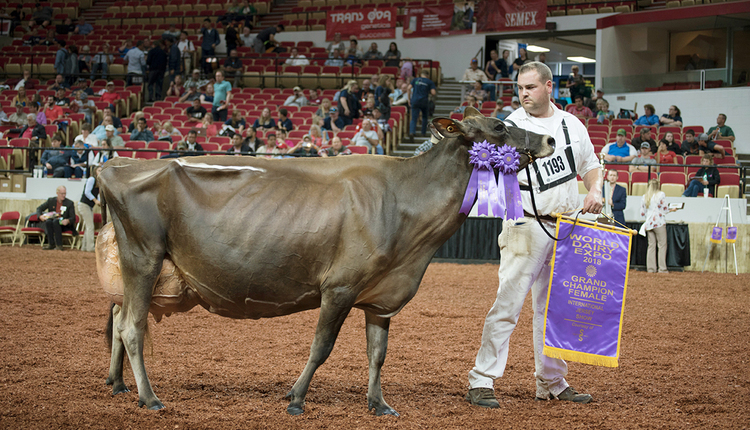 Reserve Senior Champion was RRF Comerica Daisy, exhibited by River Valley Farm and Reinholt Jerseys of Tremont, Ill. Townside Tequila Response R, owned by Rivendale Farms of Pittsburgh LLC of Bulgar, Pa., was Reserve Intermediate Champion. The Junior Champion was Milksource Gentry Marriot-ET. The fall calf is owned by Milksource Genetics and Finca Valparaiso of Kaukauna, Wis. Mikaela Joy Yoder of Abbotsford, British Columbia, Canada, owned the Reserve Junior Champion, Arethusa Fizz Callie-ET. In the Junior Show, SV Impression Holly-ET was named Senior Champion and then Grand Champion of the show. The 5-year-old cow was exhibited by Ben, Andy, Blessing, and Grace Sauder of River Valley Farm from Tremont, Ill. Reserve Grand Champion went to Meadow Ridge Jackknife Summer, an aged cow owned by Michael Riebe and Alleah and Emma Anderson of Cumberland, Wis.
Meadowridge Fizz Sparkle was named Junior Champion of the Junior Show. The winter yearling was owned by Cole Kruse and Gene Henderson of Dyersville, Iowa. Wildweed Primero Lightning earned Reserve Junior Champion honors. Michael and Megan Moede and Katie Ledvica of Algoma, Wis., showed the fall yearling heifer. There were 109 animals exhibited in the Junior Show. The Premier Breeder of the show was Pleasant Nook Farms of Ayr, Ontario, Canada. Rivendale Farms of Pittsburgh LLC, Bulger, Pa., was named Premier Exhibitor. Premier Sire was Tower Vue Prime Tequila-ET. 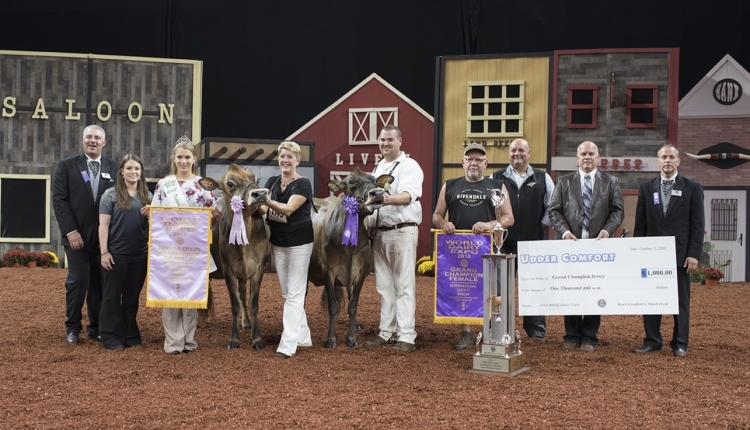 In the heifer show, South Mountain Jerseys of Boonsboro, Md., earned the Premier Breeder banner while Meadow Ridge Jerseys, Cumberland, Wis., was Premier Exhibitor. Sunset Canyon Andreas was the Premier Sire of the heifer show.